A self-referral service that enables patients to access NHS treatment for several eye conditions. You can be seen by optometrists in a local opticians practice instead of going into hospital. Go to www.lslloc.org and click on the ‘minor eye conditions scheme’ to find participating practices. Suitable for self-referral: Red eye, sticky eye (difficulty opening eye or yellow discharge), watery eye (excessive tears), pain or discomfort in or around the eyes, recent onset or sudden increase of flashes of light or floating objects in your vision. If unsure whether you need medical attention, call one of the participating Optician practices who can advise you. If you are unable to attend a local community optical there are several visiting opticians. Go to: www.lslloc.org and select the ‘local practices’ tab. Alternatively, call Homesight – 0800 080 6096 or Specsavers – 0800 198 1132 for mobile services. If you have an eye problem, you can make an emergency appointment with an optician (also known as an optometrist). These appointments are provided free by the NHS and will ensure you receive the right specialist care as soon as possible. 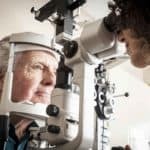 Opticians (optometrists) have the same specialist equipment as specialist eye doctors (hospital ophthalmologists) and may be able to treat and manage your eye problem without a need for you to go anywhere else. They can also refer you to a hospital eye clinic if necessary. To make an emergency appointment, telephone your optician/optometrist or call 111 to speak to an adviser when your local optician is not available out of hours.